Musings of an Artist's Wife: Talk About Good! 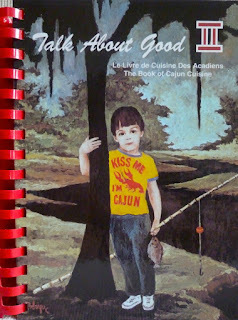 In 1979 George Rodrigue loaned twenty of his Cajun paintings for use in Talk About Good II, a cookbook produced by the Junior League of Lafayette, Louisiana. The paintings introduce the book’s chapters and include dinner scenes, seafood preparations and Cajun characters, each complemented by Rodrigue’s brief descriptions. 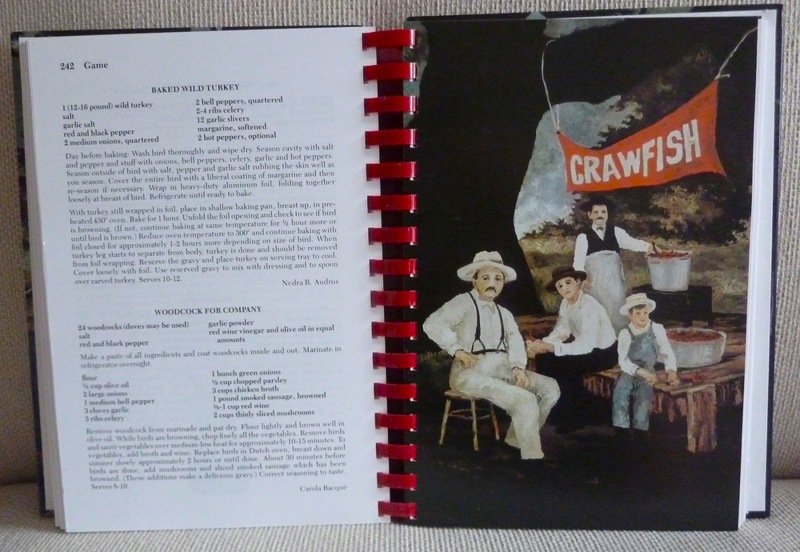 Originally the painting A Toast to Cajun Food (from the collection of the University Art Museum in Lafayette) graced the cookbook’s cover; however the Junior League swapped the front and back covers for the newest edition. 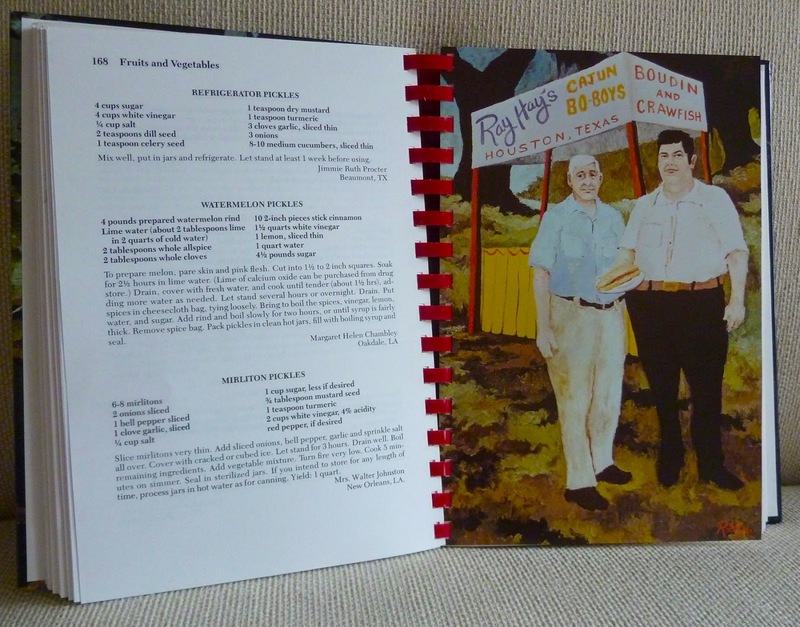 Within the cookbook, paintings such as Ray Hay’s Cajun Po-Boys introduce the Meat Chapter, opposite a page dedicated to ‘refrigerator,’ ‘watermelon,’ and ‘mirliton’ pickles. 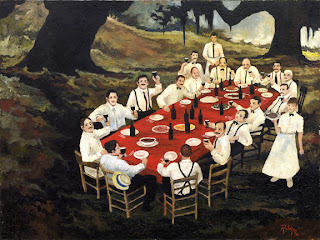 “This painting portrays Ray Hay holding his Cajun Po-Boy sandwich, and beside him is Bud Petro of Lafayette, Louisiana. The two are discussing one of the new items on the menu, Petro’s juicy fried rabbit. The preparation of the rabbit is so secret, that Mr. Petro was flown in to Houston to teach the cooks how to prepare this Cajun delicacy.” – G.R. As with the Gourmet Dinner Clubs, The Ragin Cajun deserves its own blog post, and I encourage you to read that history, linked here. 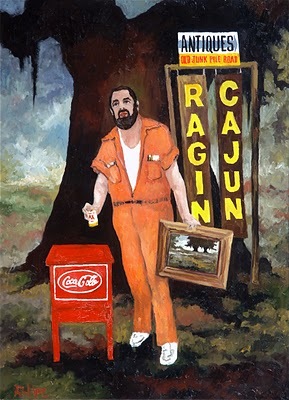 Thirty-two years later, both the recipes and paintings hold up, and Rodrigue remains committed to this worthwhile hometown cause. Excellent Wendy. Thanks so much for sharing the neat story. Tell G hello from Texas. I have this cookbook. I took the pictures and had them framed and hung up in my kitchen. The "Kiss Me I'm Cajun" is my very favorite. I remember as a little girl having a shirt just like that one. I have been trying to find one for 2 years now. Thanks Tina! 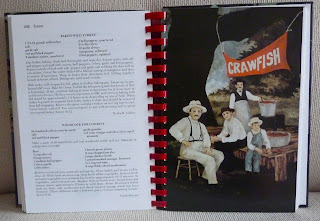 It really is a wonderful cookbook and is such a great picture in food and paintings of south Louisiana. Enjoy! And Anon, "Kiss Me I'm Cajun" is one of my favorites too. George's son Andre, pictured in that painting, is now a handsome young man and enjoys signing books with his father. Thanks for a great story on the best cookbooks that I've ever found! I have all of the Talk About Good cookbooks, receiving my first as a wedding gift in 1976! Growing up in Crowley, La. In the 70's a must for a new bride was a set of magnalite pots and a Talk About Good cookbook! I still use them, my cookbook is without a cover as back in the day, they did not have hard covers. Thanks again for sharing the wonderful stories. Thank you, Melba. I too treasure those cookbooks and magnalite pots. Gotta love the South!